In painting and other fine arts, there are three primary colors: red, blue, and yellow. They are called primary colors because they cannot be created by mixing any other colors. Primary colors form the basis for color theory or color mixing, as these three colors are the basic building blocks of color from which it is possible to mix most other colors. A primary color can be any of the red, blue, or yellow pigments available to a painter. Each combination will give you a different result, and that's part of what makes color mixing with paints so interesting. You can also use the primaries used in printing (magazines, newspapers etc.) which are magenta, cyan, and yellow (plus black), but limiting yourself to these means you never explore the rich potential of paint color mixing and the subtle differences between pigments. 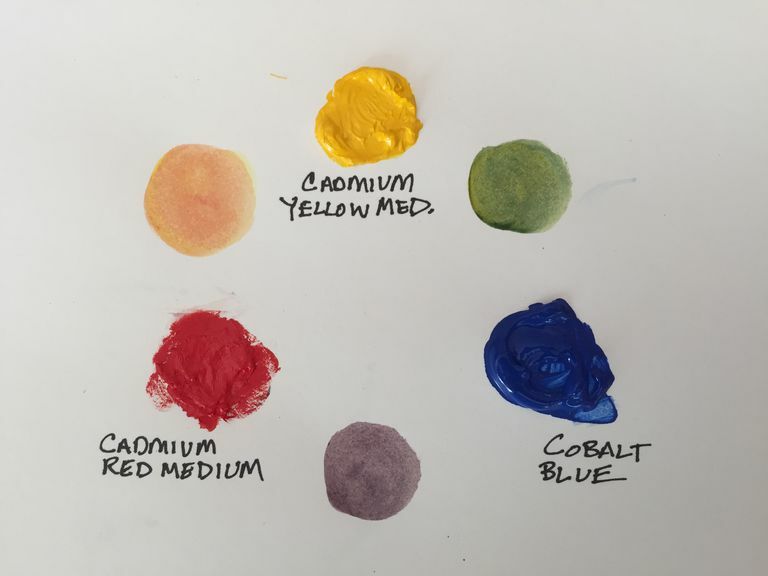 Some artists consider cadmium red medium, cobalt blue, and cadmium yellow light to be the closest pigment colors to spectrum primaries (those primary colors within the visible spectrum of light). Others consider cadmium yellow medium to be closer to primary yellow. Much of it is dependent upon the particular recipe of the paint manufacturer. The triad of primary colors form the points of an equilateral triangle within the color wheel. The secondary colors are made by mixing two of the primaries together in equal concentrations. Therefore yellow mixed with blue makes the secondary color, green; red mixed with blue makes the secondary color, purple; and yellow mixed with red makes the secondary color, orange. Primary colors in paint are subtractive. This means they absorb, or subtract out, light from the visible spectrum and reflect back the color we actually see. Black, then is the absence of all spectrum colors. Therefore when all three primary colors are mixed together, the result is a dark brown color since much of the light in the visible spectrum is absorbed. Also then, a primary color can be toned down, or made more neutral, by mixing a little bit of the secondary color that is its complement (opposite it on the color wheel) since this secondary color is a combination of the two other primaries. Primary colors in paint are different than primary colors in light, which are additive. This means that the more colors of light that are added to a beam of light, the closer it gets to pure white light. Mixing different hues of two primary colors together will result in different secondary colors. For example, whether you mix an alizarin crimson or a cadmium red medium with cadmium yellow medium will influence the exact hue of the secondary color, orange, as will the amount of each primary color you use. Alizarin crimson is a cool red (it has a blue bias), whereas cadmium red medium is a warm red (it has a yellow bias). Cadmium yellow medium is also a warm yellow (vs. hansa or lemon yellow which is cooler). Therefore when you mix cadmium red medium with cadmium yellow medium you are mixing two warm colors together and will get a purer orange than when you mix a warm and a cool color together, such as alizarin crimson and cadmium yellow medium, which also introduces the third primary blue in the blue bias of the cool alizarin crimson, thus neutralizing the secondary color a little bit. Follow these steps to creating a color wheel using a warm and cool hue of each primary color to see the range of colors that you can mix from only six different paints.